Twelve-year-old Spruce Campbell with his BAFTA Young Game Designers Award. 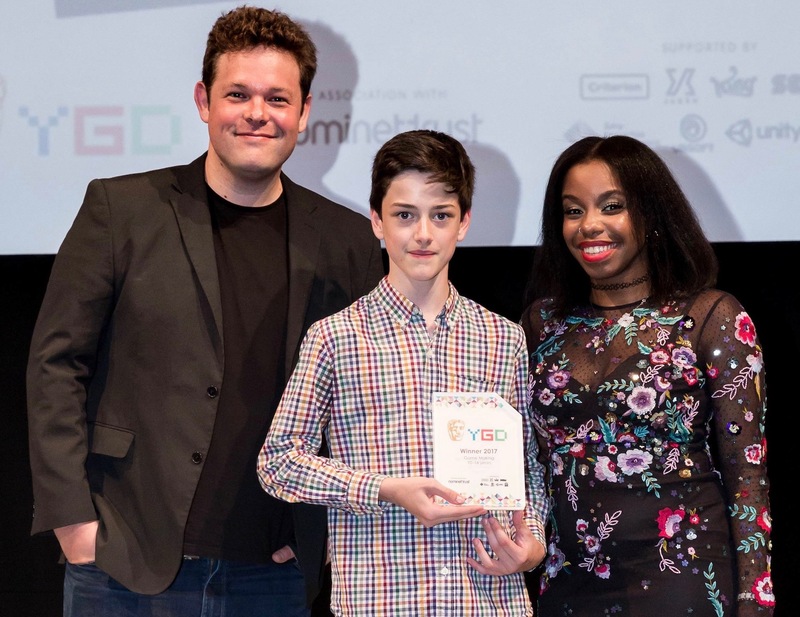 Pictured with him are games designer Mike Bithell, and CITV presenter London Hughes. Twelve-year-old Spruce Campbell, who lives near Uckfield, is one of four winners of a BAFTA Young Game Designers competition. Spruce, who lives on the Ashdown Forest, near Nutley, and attends Sevenoaks School, won his national award in the Game Making (10-14 years) category with his CyberPNK game. It was presented at a ceremony at the London headquarters of BAFTA (British Academy of Film and Television Arts). Spruce will receive a package of prizes including a mentor from the games industry, to help him develop his skills further, tours of leading games studios, game development software and a prototype of his game created by a team of developers. Hosts at the awards ceremony were Dev Griffin of BBC Radio 1, and Georgie Barrat of The Gadget Show, and the awards were presented by game designer Mike Bithell of Thomas Was Alone; CITV presenter London Hughes, Scrambled! ; The Xtra Factor presenter Matt Richardson; games producer Adrienne Law, Monument Valley 2; chair of BAFTA’s Games Committee Nick Button-Brown, and David Gardner, BAFTA’s vice-president for games. In Spruce’s game CyberPNK the gamer is persuaded to try new VR software that takes them into ‘Hivemind’ a dangerous corporate labyrinth with alternate realities. Once caught up in this world the gamer is accused of being a convicted criminal and sentenced to indefinite years in the game, unless they can successfully complete the different levels to escape. Spruce said: “Creating a game from scratch was harder than I could have imagined, but when I was standing on the stage at BAFTA all the hours that I put into it were suddenly 100% worth it. Spruce is now developing his game further, building different levels, and hoping for a commercial release by the end of the summer. 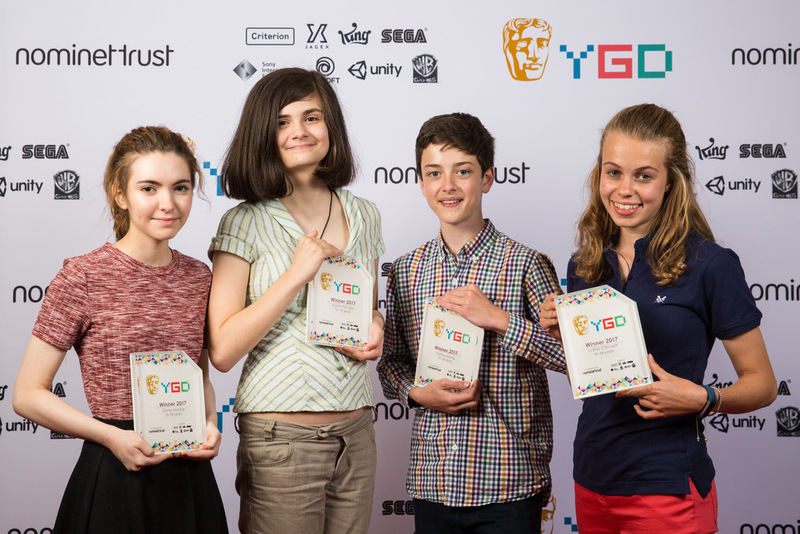 Spruce Campbell with other BAFTA Young Game Designers Award winners. From the left are Emily Mitchell (Game Making Award 15-18 years), Elsie Mae Williams (Game Concept Award 10-14 years), and Anna Carter (Game Concept Award 15-18 years). The Duke of Cambridge, president of BAFTA sent a message of support to all the young finalists saying: “I am always so impressed with the unique ideas and game-making skills displayed by our Young Game Designers. Chris Ashworth, Programme Director at Nominet Trust, which worked with BAFTA on the competition, said: “At Nominet Trust, we’re passionate about creating opportunities for young people to engage in digital making, particularly girls who are under-represented in the games industry and people from disadvantaged backgrounds. We’re thrilled to see that 75% of this year’s winners are female. 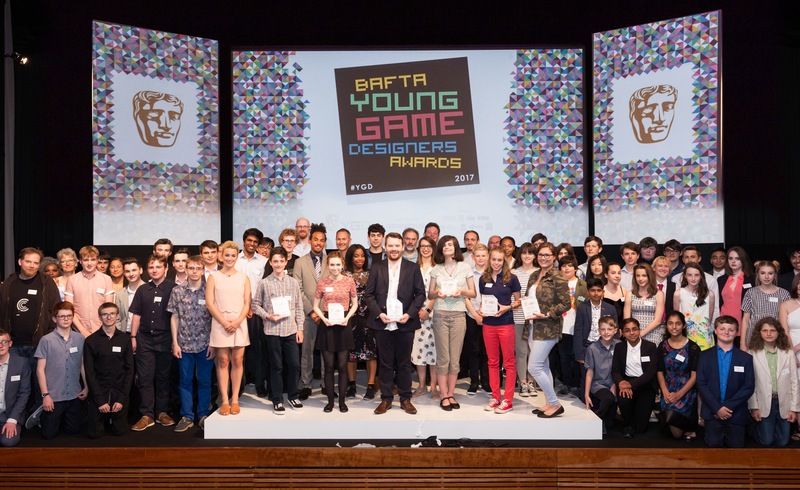 On stage at the BAFTA Young Game Designers Awards ceremony, with other young finalists and winners is Spruce Campbell.